Get the real Amsterdam feel and stay in the green heart of Amsterdam! This modern Hostelling International hostel is centrally located right in the middle of the famous Vondelpark, within walking distance of the Van Gogh Museum and the Rijksmuseum. We’re at crawling distance from the Leidseplein, with its famous nightlife and clubs like Paradiso, Melkweg and Jimmy Woo! The hostel is partly located in a monumental chalet building from which you’ll have a stunning view over the Vondelpark while enjoying breakfast. We have 536 beds divided over two-, four-, six- and eight-bedded rooms and some large dormitories. All rooms have a shower, toilet and washbasin and free individual lockers (bring your own padlock or buy one at reception). Rates include bed linen, breakfast, taxes and free Wi-Fi. Other facilities include a game room, meeting rooms, lobby area, high-speed internet facilities, free Wi-Fi, a laundrette, bike shelter, bike rental, tourist info and discount tickets, electronic door locks, lockers and safes. Our reception is open 24/7 and there’s no curfew. Towels and padlocks for the luggage lockers can be bought at the desk (or you can bring your own, of course). Hostelling International and Stayokay members receive a discount of €2.50 per night and 10% discount on all food and drinks in our bar. You can buy a Stayokay membership card at the reception for €17.50. If you are under 27 years of age, it’s only €15 to take advantage of these and a lot more discounts worldwide. Our lively bar has sports on TV and good music. Here you'll meet lots of people. We serve hearty and healthy food at great prices and we have a daily Happy Hour and the cheapest beer in town. And of course there’s a 10% discount for all HI/Stayokay members. In our restaurant there’s a great view over the Vondelpark. We serve a buffet-style breakfast from 7.30am till 10am with organic bread, fresh fruits, cheeses, yogurt, cereals and a large selection of hot drinks such as cappuccino and cafe latte. 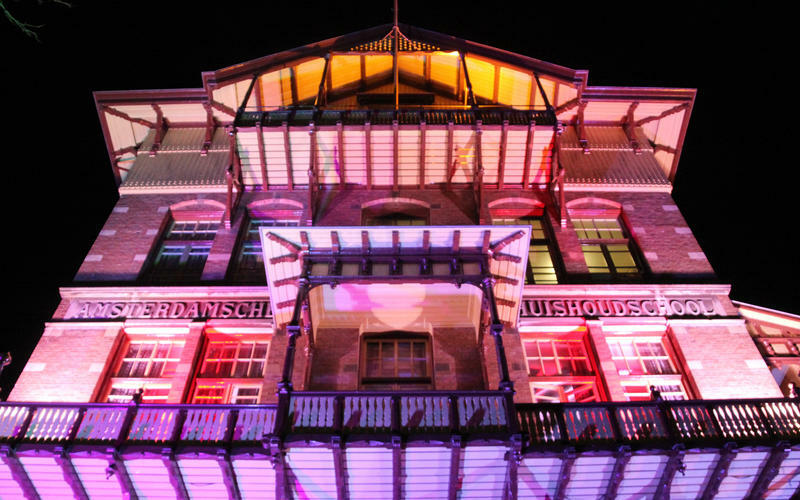 Consume culture, shop till you drop and dance the night away in Amsterdam. Stayokay Amsterdam Vondelpark is your best starting point! Guests under the age of 18 must be accompanied by a parent or legal guardian. Please read our Things to Note below before booking. City tax is not included, please pay upon arrival, €1.25 per person per night. Take tram number 1, 2 or 5. Get off at Leidseplein. From Leidseplein, walk towards the Marriott Hotel. In front of the Marriott Hotel, turn left. Zandpad is the second street to the right (small street just before the park entrance). Take a train to Central Station then follow directions as above. From the highway (A10) take exit S-106. Follow the signs for Oud-West and/or Centre. At the roundabout go right, still following the signs for Oud-West and/or Centre. You will drive on the Overtoom; follow this street all the way to the end. Here you will come to a T-junction. Turn right onto the Stadhouderskade. Zandpad is the third street on the right (small street just before the park entrance). The street is only accessible for cars (no busses). Please note that we don't have any parking facilities in front of the hostel. You are welcome to leave your car in front of the hostel for 10 minutes while you check in and unload.